The flu season is in full effect! Since this condition is highly contagious, prevention is key. Including Elderberries daily is an effective way to help boost the immune system in order to keep the flu bug out of your family household. If symptoms arise, have the whole family double the dose of Elderberry syrup or gummies (recipe to follow) and take Echinacea tincture every 2 hours. Did you know that while the cold and flu season officially starts in the fall, it can last all the way to May? This gummy bear recipe is a delicious way for you to prevent infections as well as shorten the duration of them. Elderberries have long been used as an ally against upper respiratory infections. They’ve been scientifically proven to be effective against at least 8 different influenza viruses, which as a parent, I find pretty amazing! To get the best results from elderberries, take them to prevent infection or at the very onset, and during an infection to lessen the symptoms and shorten the duration of a cold or flu! The flavonoids within elderberries prevent the virus from replicating. Last year, my family escaped getting either a cold or flu, but with life’s events, mommy forgot to replenish the container with new gummies and we all ended with a cold. This proved to me how effective our daily consumption of delicious elderberry flavored gummies were helping us. Supporting herbs are added to the recipe for an extra “oomph“. You an purchase your herbs at different locations in the Ottawa region or order them online. Just make sure they are organic and from a trusted source. Here’s a quick look into why these herbs in this formula are also important. Rosehips are high in nutrients and potentially a great source of vitamin C, which is important for immune system function. Cinnamon is an aromatic and pungent herb that is highly antimicrobial. It is included in this recipe to “warm up” the recipe. It also is great tasting! Licorice is another powerful antiviral herb and is a wonderful synergistic herb that can be added in small amounts to formulas. Licorice should not be used as a single herb and is better used in small amounts as part of a larger formula. It should not be used for people with hypertension or during pregnancy. Licorice is known for its antiviral properties. Oatstraw is very nutritive and a very good source of calcium. It nourishes the liver and strengthens the adrenals. It also provides a deep, restorative sleep. Nettle leaf is a valuable nourishing and tonic herb. It nourishes and energizes endocrine glands and strengthens the nervous system. It is also known as the best herb to provide iron. Pepper may seem like a strange addition to this recipe. There’s no need to worry, since the end taste isn’t noticeable. Pepper is a wonderful activator herb that helps other herbs be more effective. 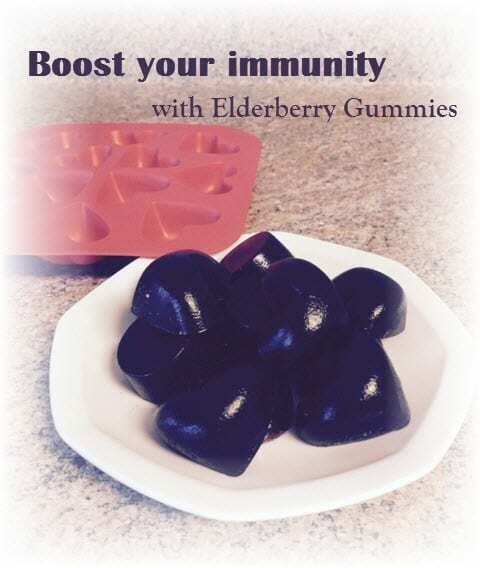 The second part of this recipe is turning your elderberry juice (or syrup) into fun shaped elderberry gummies. I can’t claim credit for this fun idea, but I knew I wanted to try it for my boys (okay, and myself) when I first started seeing recipes for it popping up. It’s a good idea to get good quality gelatin with collagen peptides. You can find great brands sold on Amazon. Collagen is the most abundant protein in the body and is a key constituent of all connective tissues. Collagen provides the infrastructure of the musculoskeletal system, essential for mobility ensures the cohesion, elasticity and regeneration of skin, hair, tendon, cartilage, bones, and joints. Since gelatin is pasture raised bovine, vegetarians and vegans may want to stick with the elderberry syrup recipe. Since my eldest is Hypoglycemic, I wanted something that didn’t have a lot of added honey or sugar. The apple cider and the natural sweetness of the herbs makes this recipe a winner in my household. But, if you find the taste not sweet enough, you can add a teaspoon or two of raw honey. In this recipe, we first make a juice from dried elderberries and other herbs then we use gelatin to make gummy shapes. You will enjoy them just as much as your kids! Trust me! Place all the ingredients in a medium sized sauce pan. Bring to a simmer and continue to simmer for 20 minutes. Strain through cheesecloth and squeeze well to extract the juice. If you want to make the gummies, go to step 2. If you want to simply make elderberry syrup, you can now add honey to your taste preference and keep it stored in the fridge. The amount of honey you add will be the determining factor in how long it lasts. The more you add the longer it will last. The dose I recommend for a child is 1-2 teaspoons a day. Adults can take 1-3 tablespoons per day. If you feel like you are getting sick you can drink up to a cup per day. Measure out 2 cups of the above juice (without the added honey). Add more apple cider if necessary so you have the full two cups. Reserve 1/2 cup of the juice in a measuring glass. Put it in the fridge until it is cold. Once it is cold, sprinkle the gelatin over the juice and let sit for one minute. Bring the rest of the juice to a simmer. Pour the hot juice over the cooled juice and gelatin, stirring briskly with a whisk. Continue to whisk for about 2 minutes or until the gelatin is completely dissolved. If desired, add honey. You might find it is sweet enough already. Pour the mixture into silicon molds OR pour into a glass pan. Put them in the fridge to harden. Once they are hardened they should remain hard. Remove them from the molds.If using a glass pan, cut them into cubes. Store in a closed container in the fridge. They should last several weeks, but if your family is anything like mine, they won't last that long! I recommend 1-2 small gummies a day for a child and 1-3 gummies for the bigger kid (A.K.A. mom and dad). Great recipe – I would love to try making these. I wasn’t familiar with the benefits of elderberries! I remember getting Rosehip syrup as a child, I loved it but in those days there was probably a lot of additions to the actual Rosehip. My grandparents also grew elderberries, I can’t remember what they made with them though, I think wine was one of the things. didnt even know you could get ingredients like this. do you know if they are available at bulk barn? I’m sure you can get some of the ingredients at Bulk Barn, but I usually get mine either at a natural food store or at Herb and Spice or Mother Earth Natural Foods.